Prestini’s parents were Italian immigrants who settled in Waterford, Connecticut, where the artist was born. He was called “Libero,” in honor of liberty; older brothers were named for equality and fraternity. Industrious and self-sufficient, the family moved to Westerly, Rhode Island, where James attended local schools and studied woodworking at a trade institute. Prestini’s future brightened considerably when Thomas J. Watson, Sr., founder of IBM, (for whom the youth caddied at a local golf course) facilitated his enrollment at Yale University. He graduated with a degree in mechanical engineering in 1930; during the Depression, he returned for a second degree in education and briefly taught high school mathematics. Beginning in 1933, Prestini produced exquisitely graceful, wafer-thin bowls, cups, and trays from mahogany, birch, cherry, and beech. His high level of craftsmanship caught the attention of the local art community, which led in 1939 to his joining the faculty of the New Bauhaus, later known as the Illinois Institute of Technology. Mies van der Rohe, Lazlo Moholy-Nagy, and Herbert Bayer—associates of the Bauhaus in Germany before the Nazis closed it—became close colleagues and friends. During this period, Prestini designed furniture for Knoll International, a company noted for sleek modernist designs. Prestini was invited to teach at Black Mountain College during the summer session of 1944, the first time the school had offered institutes in art and music using distinguished faculty drawn from other institutions. Prestini’s aesthetic and craftsmanship dovetailed nicely with that of Josef Albers. He also taught briefly at other institutions. In 1953, Prestini traveled to Italy, where he studied sculpture. He returned to the United States three years later to establish the design laboratory for the College of Environmental Design at the University of California, Berkeley. 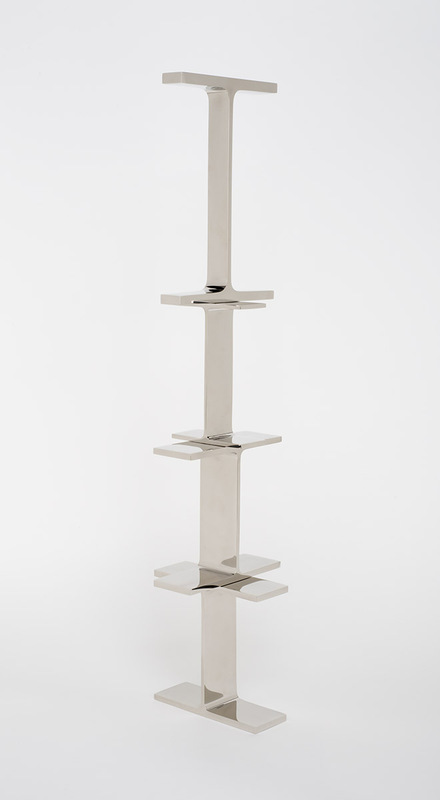 Using his background in mechanical engineering, familiarity with the Bauhaus aesthetic, and keen interest in standardized structural elements, Prestini crafted highly polished steel and aluminum pieces, many formed from I- and H-beams. The San Francisco Museum of Modern Art hosted a 1969 retrospective exhibition, which included a selection of four hundred sculptures. Examples of Prestini’s work can be found at the Museum of Modern Art, the Smithsonian American Art Museum, and the Metropolitan Museum of Art.